Pets are part of the family. Gift your someone special (and his or her furry friend) with one of the Pet & Owner Combo Gifts from BisketBaskets.com. 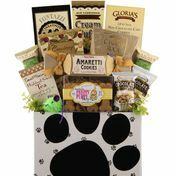 Made for pet lovers, these fun and thoughtful gift baskets are the perfect way to celebrate a birthday or to welcome a new pet home. Filled with treats and goodies for pets and people, these thoughtful gifts are great for a friend, family member, or your veterinarian! No matter who is on your shopping list or what the occasion, BisketBaskets.com has Gifts For Pets & Owners that are something to bark about!